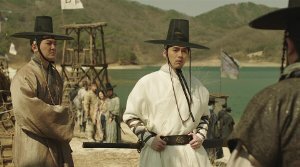 Review: Like their colleagues in Hollywood, filmmakers in Korea like to play it safe. Therefore, we mostly get to see supposedly gripping action thrillers or moderately funny romcoms from the country. But here and there, we get to see fascinating genre mixtures. Like "Monstrum", which also came out this year and meshed up royal intrigues with a monster flick. 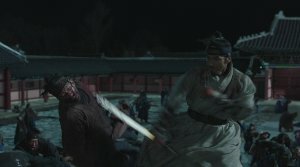 So why not just use zombies who strike terror into people's hearts during the Joseon dynasty? After all, cleverly used zombies turned "Train to Busan" into an internationally successful movie, as well. 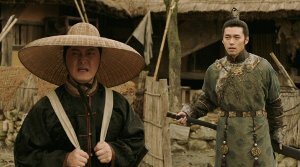 But the problem with "Rampant" is that the movie struggles with poorly written characters and a focus which alternates too much between political thriller at court and zombie apocalypse. In the end, the movie is easy on the eyes, but also pretty dull. 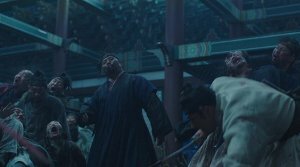 The Netflix show "Kingdom" currently shows us that zombies during the Joseon dynasty can actually work. 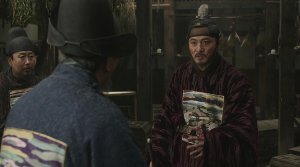 "Rampant", on the other hand, introduces its zombies rather quickly and this may come as a surprise at the beginning. Not without good reason, as they disappear as quickly as they showed up and take a back seat as if they are just annoying insects. They don't really seam life threatening, because the protagonists manage to easily fight their way through hordes of zombies with their swords. The lack of menacing atmosphere in those scenes quickly leads to a sense of disappointment for the audience. Your search for horror moments will be in vain. It also remains a secret why the undead burst into flames when they get into the sunlight and why they have a thirst for blood. This makes them seem more like vampires, whereas later on, countless undead charge at our protagonists in a wave-like attack which is clearly reminiscent of "World War Z". Fortunately, scenes like these are used sparsely. So, after all, the zombies do get a little bit threating towards the finale, but only due to their quantity and the fact that only a small bite is enough to get infected. However, you will also have to deal with some unanswered questions here. For instance, it remains unclear whether amputating an infected limb is enough to stop the transformation. This happens to one of the characters, who then turns into some kind of super-zombie. He still has a human conscious, but also superhuman powers. Here the script shows some kind of B-movie-charm, which does not manage to captivate us, though, because it stands in stark contrast to the high production value of the rest of the movie. Therefore, we are just dealing with a sloppy script. This can also be seen in all those heroic attempts of the characters' self-sacrificing actions towards the end of the movie, where suddenly everybody tries to be a hero with speeches that are supposed to pull at your heartstrings. Even though, all this is not really necessary. And none of those scenes manage to touch us emotionally. This is also the flick's biggest weakness. None of the characters affect us and therefore we don't really take an interest in their decisions. 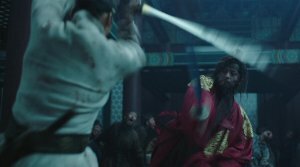 With Hyun Bin they cast a superstar in the lead to attract a female audience as well, but his role is too two-dimensional, which gets even more obvious when his character inevitably changes into a prince for whom the people are suddenly important. But when did all this character development happen? It is not only the poorly written script's fault that we sometimes get the impression that we missed entire scenes. 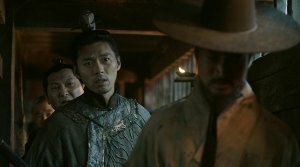 Director Kim Seong-hoon, who has already worked with Hyun Bin in "Confidential Assignment", does not manage to place special emphasis on the things that are actually important at a specific moment either. 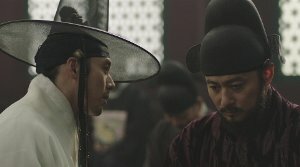 There is the political banter with Jang Dong-gun ("VIP"), who plays the forgettable villain - another good actor whose talent was wasted - and towards the end, there is a big finale during which the zombies storm the palace. How we got from one point to the next remains completely unclear. The finale, as such, is rather entertaining, though, because in the end, the heroes do butcher their way through hordes of zombies. But everything seems too streamlined somehow. This also applies to the violence. Even though there are some heads flying around, you can still see that we are dealing with CGI and this destroys any sort of horrifying atmosphere. In addition, the CGI smoke is also not really convincing and on top of that it is used far too frequently. Then, next to the shallow main characters, there are the secondary characters who are even worse. It seems to be a current trend that women know how to use a bow, but the archeress is as unimportant for the movie's plot as the hero's sister-in-law. And then there is the clich�-driven feminine appearance of the prince's companion, which just makes you roll your eyes. In the end, "Rampant" does not keep its promise of a nice genre mix. The movie is not written very well and it lacks a common thread running through it. But what brings about the movie's downfall are the uninspired characters, which is why you are never really emotionally invested in the action, even though those scenes could have been fun to watch.